At Boca Park Animal Hospital, we take pride in providing our patients and their human caretakers with all the information necessary to help cat owners make educated decisions about all facets of feline nutrition, cat foods included. This is also why we work closely with a certified veterinary nutritionist at our practice. From 3-5 weeks of age, feeding kittens involve offering the milk-replacer formula in a shallow dish to encourage weaning from a bottle. You can also add a moist, easily chewable diet consisting of a mixture of warm milk-replacer and high quality canned or dried kitten food 4-6 times a day. By 5-8 weeks of age, your kitten should be able to chew its own kitten food, and you should provide a protein rich and energy filled diet, with feedings taking place 3-4 times daily. There are many different types of kitten food available, and we would like to discuss these dietary options with you at your next veterinary appointment. Typically we recommend canned kitten food because it will mimic the natural diet both inconsistency and formulation. However, a good diet may also consist of a combination of canned and dry kitten foods. After 6 months of age, kittens should be fed 2 times per day. Our veterinarians and nurses are more than happy to discuss nutrition and the best route for your pet at one of our consultations. Proteins also contain essential amino acids that synthesize or break down and utilize, the protein molecules themselves. Amino acids are synthesized in the liver with the help of carbon and nitrogen. There are 30 total amino acids, 20 dispensable (or non-essential) and 10 non-dispensable (or essential). Dispensable refers to the ability to be safely absent from a diet. 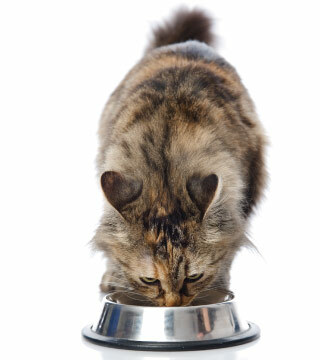 This means the 10 non-dispensable, or essential amino acids must come from a cat’s diet. A high quality cat food that follows a sound feline nutrition requirement protocol will only use unprocessed or minimally processed fish, poultry and meat that contain upwards of 40% of this feline nutrition requirements per serving.